Nd:YAG (neodymium-doped yttrium aluminum garnet; Nd:Y3Al5O12) is a crystal that is used as a lasing medium for solid-state lasers. The dopant, triply ionized neodymium, Nd(III), typically replaces a small fraction (1%) of the yttrium ions in the host crystal structure of the yttrium aluminum garnet (YAG), since the two ions are of similar size. It is the neodymium ion which provides the lasing activity in the crystal, in the same fashion as red chromium ion in ruby lasers. Laser operation of Nd:YAG was first demonstrated by J.E. Geusic et al. at Bell Laboratories in 1964. Nd:YAG lasers are optically pumped using a flashtube or laser diodes. 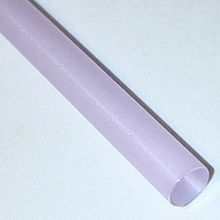 These are one of the most common types of laser, and are used for many different applications. Nd:YAG lasers typically emit light with a wavelength of 1064 nm, in the infrared. However, there are also transitions near 946, 1120, 1320, and 1440 nm. Nd:YAG lasers operate in both pulsed and continuous mode. Pulsed Nd:YAG lasers are typically operated in the so-called Q-switching mode: An optical switch is inserted in the laser cavity waiting for a maximum population inversion in the neodymium ions before it opens. Then the light wave can run through the cavity, depopulating the excited laser medium at maximum population inversion. In this Q-switched mode, output powers of 250 megawatts and pulse durations of 10 to 25 nanoseconds have been achieved. The high-intensity pulses may be efficiently frequency doubled to generate laser light at 532 nm, or higher harmonics at 355, 266 and 213 nm. 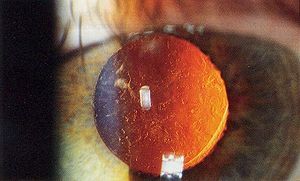 Nd:YAG lasers are used in ophthalmology to correct posterior capsular opacification, a condition that may occur after cataract surgery, and for peripheral iridotomy in patients with acute angle-closure glaucoma, where it has superseded surgical iridectomy. Frequency-doubled Nd:YAG lasers (wavelength 532 nm) are used for pan-retinal photocoagulation in patients with diabetic retinopathy. In certain cases these lasers are also used to treat eye floaters. Nd:YAG lasers emitting light at 1064 nm have been the most widely used laser for laser-induced thermotherapy, in which benign or malignant lesions in various organs are ablated by the beam. In oncology, Nd:YAG lasers can be used to remove skin cancers. They are also used to reduce benign thyroid nodules, and to destroy primary and secondary malignant liver lesions. To treat benign prostatic hyperplasia (BPH), Nd:YAG lasers can be used for laser prostate surgery—a form of transurethral resection of the prostate. These lasers are also used extensively in the field of cosmetic medicine for laser hair removal and the treatment of minor vascular defects such as spider veins on the face and legs. Nd:YAG lasers are also used to treat Venous Lake lip lesions. Recently used for Dissecting cellulitis of the scalp, a rare skin disease. Nd:YAG dental lasers are used for soft tissue surgeries in the oral cavity, such as gingivectomy, periodontal sulcular debridement, LANAP, pulpotomy, frenectomy, biopsy, and coagulation of graft donor sites. Nd:YAG lasers are used in manufacturing for engraving, etching, or marking a variety of metals and plastics, or for metal surface enhancement processes like laser peening. They are extensively used in manufacturing for cutting and welding steel, semiconductors and various alloys. For automotive applications (cutting and welding steel) the power levels are typically 1–5 kW. Super alloy drilling (for gas turbine parts) typically uses pulsed Nd:YAG lasers (millisecond pulses, not Q-switched). Nd:YAG lasers are also employed to make subsurface markings in transparent materials such as glass or acrylic glass. Lasers of up to 2 kW are used for selective laser melting of metals in additive layered manufacturing. In aerospace applications, they can be used to drill cooling holes for enhanced air flow/heat exhaust efficiency. Nd:YAG lasers are also used in the non-conventional rapid prototyping process laser engineered net shaping (LENS). Laser peening typically uses high energy (10 to 40 Joule), 10 to 30 nanosecond pulse, flashed laser systems to generate gigawatts of power on the surface of a part by focusing the laser beam down to a few millimeters in diameter. Laser peening is unlike the other manufacturing processes in that it neither heats or adds material; it is a mechanical process of cold working the metallic component to impart compressive residual stresses. Laser peening is widely used in gas fired turbine engines in both aerospace and power generation for component damage tolerance improvement and fatigue life and strength increase. Nd:YAG lasers can be used for flow visualization techniques in fluid dynamics (for example particle image velocimetry or laser-induced fluorescence). Nd:YAG lasers are frequently used to build optical tweezers for biological applications. This is because Nd:YAG lasers mostly emit at a wavelength of 1064 nm. Biological samples have a low absorption coefficient at this wavelength, as biological samples are usually mostly made up of water. As such, using an Nd:YAG laser minimizes the damage to the biological sample being studied. Researchers from Japan's National Institutes of Natural Sciences are developing laser igniters that use YAG chips to ignite fuel in an engine, in place of a spark plug. The lasers use several 800 picosecond long pulses to ignite the fuel, producing faster and more uniform ignition. The researchers say that such igniters could yield better performance and fuel economy, with fewer harmful emissions. The Chinese ZM-87 blinding laser weapon uses a laser of this type, though only 22 have been produced due to their prohibition by the Convention on Certain Conventional Weapons. North Korea is reported to have used one of these weapons against American helicopters in 2003. For many applications, the infrared light is frequency-doubled or -tripled using nonlinear optical materials such as lithium triborate to obtain visible (532 nm, green) or ultraviolet light. Cesium lithium borate generates the 4th and 5th harmonics of the Nd:YAG 1064 nm fundamental wavelength. 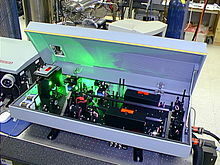 A green laser pointer is a frequency doubled Nd:YVO4 diode-pumped solid state laser (DPSS laser). Nd:YAG can be also made to lase at its non-principal wavelength. The line at 946 nm is typically employed in "blue laser pointer" DPSS lasers, where it is doubled to 473 nm. ^ a b Koechner §2.3, pp. 48–53. ^ Geusic, J. E.; Marcos, H. M.; Van Uitert, L. G. (1964). "Laser oscillations in nd-doped yttrium aluminum, yttrium gallium and gadolinium garnets". Applied Physics Letters. 4 (10): 182. Bibcode:1964ApPhL...4..182G. doi:10.1063/1.1753928. ^ a b Yariv, Amnon (1989). Quantum Electronics (3rd ed.). Wiley. pp. 208–11. ISBN 978-0-471-60997-1. ^ Koechner §6.1.1, pp. 251–64. ^ Moskalik, K; A Kozlov; E Demin; E Boiko (2009). "The Efficacy of Facial Skin Cancer Treatment with High-Energy Pulsed Neodymium and Nd:YAG Lasers". Photomedicine Laser Surgery. 27 (2): 345–49. doi:10.1089/pho.2008.2327. PMID 19382838. ^ Valcavi R, Riganti F, Bertani A, Formisano D, Pacella CM (November 2010). "Percutaneous Laser Ablation of Cold Benign Thyroid Nodules: A 3-Year Follow-Up Study in 122 Patients". Thyroid. 20 (11): 1253–61. doi:10.1089/thy.2010.0189. PMID 20929405. ^ Pacella CM; Francica G; Di Lascio FM; Arienti V; Antico E; Caspani B; Magnolfi F; Megna AS; Pretolani S; Regine R; Sponza M; Stasi R (June 2009). "Long-term outcome of cirrhotic patients with early hepatocellular carcinoma treated with ultrasound-guided percutaneous laser ablation: a retrospective analysis". Journal of Clinical Oncology. 27 (16): 2615–21. doi:10.1200/JCO.2008.19.0082. PMID 19332729. ^ Pompili M; Pacella CM; Francica G; Angelico M; Tisone G; Craboledda P; Nicolardi E; Rapaccini GL; Gasbarrini G . (June 2010). "Percutaneous laser ablation of hepatocellular carcinoma in patients with liver cirrhosis awaiting liver transplantation". European Journal of Radiology. 74 (3): e6–e11. doi:10.1016/j.ejrad.2009.03.012. PMID 19345541. ^ Azevedo, L. H; Galletta, V. C; De Paula Eduardo, C; Migliari, D. A (2010). "Venous Lake of the Lips Treated Using Photocoagulation with High-Intensity Diode Laser". Photomedicine and Laser Surgery. 28 (2): 263–265. doi:10.1089/pho.2009.2564. PMC 2957073. PMID 19811083. ^ Krasner BD; Hamzavi FH; Murakawa GJ; Hamzavi IH (August 2006). "Dissecting cellulitis treated with the long-pulsed Nd:YAG laser". Dermatologic Surgery. 32 (8): 1039–44. doi:10.1111/j.1524-4725.2006.32227.x. PMID 16918566. ^ Yang J, Yin TL, Xu WM, Xia LB, Li AB, Hu J (2006). "Reproductive outcome of septate uterus after hysteroscopic treatment with neodymium:YAG laser". Photomedicine Laser Surgery. 24 (5): 625. doi:10.1089/pho.2006.24.625. PMID 17069494. ^ Ledon, Jennifer A.; Savas, Jessica; Franca, Katlein; Chacon, Anna; Nouri, Keyvan (2012). "Laser and light therapy for onychomycosis: a systematic review". Lasers in Medical Science. 29 (2): 823–29. doi:10.1007/s10103-012-1232-y. ISSN 0268-8921. PMID 23179307. ^ Mozena, John; Haverstock, Brent (May 2010). "Laser care for onychomycosis: can it be effective?". Podiatry Today. 23 (5): 54–59. ^ Mozena, John D.; Mitnick, Joshua P. (October 2009). "Emerging concepts in treating onychomycosis". Podiatry Today. 22 (10): 46–51. ^ Palafox, Gilbert N.; Wicker, Ryan B.; Elkins, Christopher J. (2003). "Rapid in-vitro physiologic flow experimentation using rapid prototyping and particle image velocimetry" (PDF). 2003 Summer Bioengineering Conference: 419. Retrieved 2007-10-10. ^ D. J. Stevenson; T. K. Lake; B. Agate; V. Gárcés-Chávez; K. Dholakia; F. Gunn-Moore (2006-10-16). "Optically guided neuronal growth at near infrared wavelengths". Optics Express. 14 (21): 9786–93. Bibcode:2006OExpr..14.9786S. doi:10.1364/OE.14.009786. PMC 2869025. PMID 19529370. ^ Coxworth, Ben (April 21, 2011). "Laser igniters could spell the end for the humble spark plug". Gizmag. Retrieved March 30, 2012. ^ Pavel, Nicolaie; et al. (2011). "Composite, all-ceramics, high-peak power Nd:YAG/Cr4+:YAG monolithic micro-laser with multiple-beam output for engine ignition". Optics Express. 19 (10): 9378–84. Bibcode:2011OExpr..19.9378P. doi:10.1364/OE.19.009378. PMID 21643194. ^ Fisher, Franklin (2003-05-14). "U.S. says Apache copters were targeted by laser weapons near Korean DMZ". Stars and Stripes. Retrieved 2016-12-20. ^ Lister, Tim. "North Korea's military aging but sizeable". CNN. Archived from the original on 2010-11-26. Retrieved 24 December 2010. ^ F. J. Duarte, Tunable Laser Optics (Elsevier-Academic, New York, 2003). ^ a b Paschotta, Rüdiger. "YAG Lasers". Encyclopedia of Laser Physics and Technology. RP Photonics. Retrieved 2018-01-16. Siegman, Anthony E. (1986). Lasers. University Science Books. ISBN 978-0-935702-11-8. Koechner, Walter (1988). Solid-State Laser Engineering (2nd ed.). Springer-Verlag. ISBN 978-3-540-18747-9.